Gingerbread Man Shakeology. Today I decided to try one of the recipes from the Winter Holiday Shakeology recipe calendar. I picked the very first recipe, Gingerbread Man Shakeology. 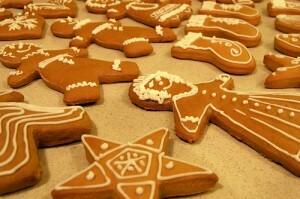 Now, this is no surprise to anyone who really knows me, since around Christmastime I become a gingerbread junkie. I’m always keeping an eye out in grocery stores for really authentic looking gingerbread and gingerbread cookies. It’s the bite of ginger that I love, mixed with the other spices. I swear up and down every year that I want to make a gingerbread house, but when I go to make a purchase, I simply can’t get past the loads of sugary candies and frosting I would be eating, so I decide against it. So I looked at the recipe, realized I had the basic ingredients, and set about my task. I poured about a cup of unsweetened vanilla almond milk, several dashes of cinnamon, a few dashes of some powdered ginger, and a heaping portion of vanilla extract (alright, it got away from me, but vanilla is pretty forgiving). I then started the blender, let it mix, then added the Shakeology and some ice. This procedure is key to great smooth shake, that is adding the Shakeology while the rest of the ingredients are already blending. Not sure why, but it makes it smoother. The result was good, but still not as gingery as I would like. I believe my flaw is using the powdered ginger instead of fresh ginger, which I will try next time. It was still very good, but a bit more like a chocolatey holiday cookie. Please comment below with your favorite recipe, what you made today, etc…and if you haven’t had the pleasure of trying Shakeology yet, click Shakeology, or contact me at jimmyolsen@yahoo.com about getting it at a discount. Talk to you soon, and look forward to seeing your recipes!